Slaughterhouse Cruelty at House of Raeford Farms EXPOSED! A new Mercy For Animals undercover investigation takes you behind the closed doors of one of the country's largest poultry slaughterhouses – House of Raeford Farms, Inc. in Raeford, North Carolina. In January and February of 2007 an MFA investigator worked in the "live-hang" area of the plant (where live birds are snapped into shackles on the slaughter line), secretly filming egregious acts of animal cruelty with a hidden camera. A worker violently punching live, shackled turkeys for "fun"
The workers responsible for the abuse cannot be charged under federal law because the USDA refuses to protect turkeys and chickens in its enforcement of the Humane Slaughter Act. As such, MFA is seeking felony cruelty-to-animals charges against House of Raeford Farms, Inc. for violating North Carolina animal cruelty statutes. 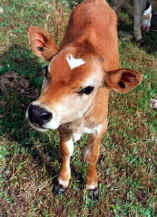 On May 18, 2007 MFA furnished the Hoke County prosecutor with a criminal complaint containing affidavits and video footage documenting slaughterhouse workers violently punching, throwing, and ripping the heads off of live animals, as well as testimony from world-renowned animal welfare scientists attesting to the pain inflicted on birds at the facility. Though the abuses MFA's investigator documented at this facility are egregious, it only begins scratch the surface of the larger picture of farmed animal cruelty in the United States. 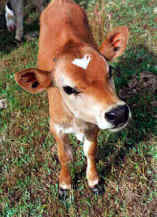 The single most powerful action you can take to end such abuse is to adopt a vegetarian diet. Click here to learn more about the investigation. The calf photo on these pages is from Farm Sanctuary with our thanks. free, lifestyle, hunting, fishing, traping, farm, farming, factory, fur, meat, slaughter, cattle, beef, pork, chicken, poultry, hens, battery, debeaking. Thee is also a similarity to the human aspects of prolife, pro life, pro-life, abortion, capital punishment, and war.